Even when the news is good, sometimes we see it sold. The earnings for 8X8 were fine and the guidance was only fractionally reduced. 8x8, Inc. provides enterprise cloud communications and customer engagement solutions for small and mid-size businesses, mid-market, and distributed enterprises worldwide. It offers unified communications, team collaboration, conferencing, contact center, analytics, and other services to various business customers on a software-as-a-service (SaaS) model. The company provides 8x8 Virtual Office, a self-contained and end-to-end solution that delivers high quality voice and unified communications-as-a-service; 8x8 Virtual Contact Center, a multi-channel cloud-based contact center solution; and 8x8 Virtual Office Meetings, a cloud-based video conferencing and collaboration solution that enables secure and continuous collaboration with borderless high definition (HD) video and audio communications from mobile and desktop devices. It also offers 8x8 Sameroom, an interoperability platform, which enables cross-team messaging and collaboration within a large organization and between organizations; and Script8, a communications flow and routing engine that offers a scripting environment for routing communications data for specific workflows, as well as allows end-users to create simple, personalized, and customizable communications experiences, such as communications control, external data source integration, and intelligent routing. The company integrates its services with third-party applications and platforms, including enterprise resource planning, customer relations management, human capital management, and other proprietary application suites. It markets its services to end users through direct sales organization, Website, and channel partners. As of March 31, 2018, the company serves approximately 53,800 business customers. 8x8, Inc. was founded in 1987 and is headquartered in San Jose, California. Company description from FinViz.com. 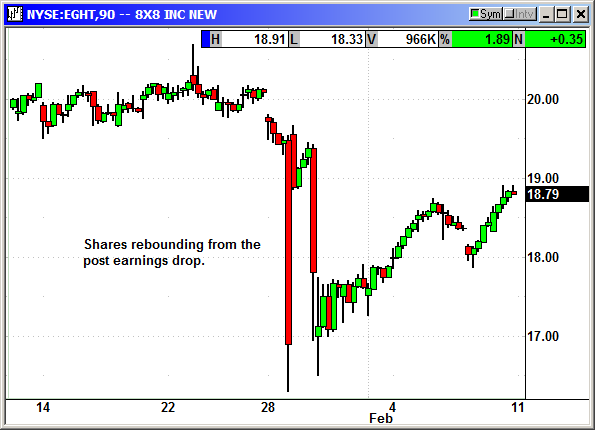 8X8 was punished severely for earnings that missed only fractionally. The company reported a loss of 6 cents on revenue of $89.9 million. Analysts were expecting a loss of 6 cents on revenue of $88.6 million. No problems there except that matching on earnings normally produces a decline in the stock. They lowered guidance for 2019 from $334-$338 million to $334-$335 million. Still not a major decline but the stock was hammered. Service revenue rose 20% with a 61% increase in customers billing more than $10,000 in monthly recurring charges. Average monthly service revenue per business customer rose to $5,211. The CEO said "we are disrupting a $50 billion addressable market that is shifting toward cloud solutions with a preference for a single technology platform." Shares fell from $19.50 to $16.50 on the earnings. They have recovered to $18.79 and continue to move higher. Buy EGHT shares, currently $18.79, stop loss $17.79. Optional: Buy May $20 call, currently $1.10, stop loss $16.95.